Heat gas or charcoal grill. In medium bowl, mix all ingredients except buns, ketchup and pickles. Shape mixture into 6 patties, about 3/4 inch thick. Place patties on grill rack over medium heat. Cover grill; cook 10 to 15 minutes, turning once, until meat thermometer inserted in centre of patties reads 160ºF. Add buns, cut sides down, for last 4 minutes of grilling or until toasted. Top burgers with ketchup and pickle slices; serve on buns. 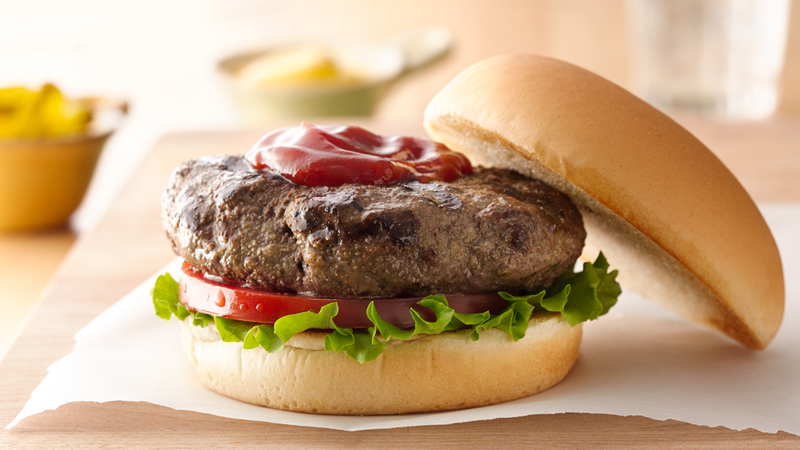 Variation: For Burgundy Burgers, substitute 1/4 cup (50 mL) Burgundy wine for the beer! Success: Avoid pressing down on a hamburger patty while it's cooking--you'll squeeze out much of the flavourful juices!